Our tournament grade pulley kit includes a pair of heavy duty shock cords, a pair of Malin Halyard Pulleys, a pair of double pulleys, one single pulley and rigging instructions. 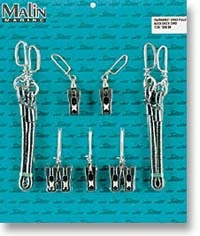 The kit is designed to double rig a single outrigger pole. Available with black or white shock cords. Release clips not included.